Australia’s Benchmark Index Jumps To Highest Level. 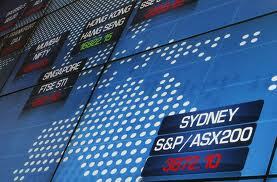 The Australian S&P/ASX200 index rose 37.3 points higher at 5358.8 points, its highest level since February 2008. “It looks like a good firm opening and that just follows on from the US on Friday night,'' said Ric Spooner, chief market analyst from CMC. Last week the European and US markets finished the week in a positive territory after the 16-day US government shutdown ended. According to Mr Spooner, the local market is at a inflection stage at which it could either rise in the coming weeks or fall and drop back. “It will be interesting to see which way the market plays it over the coming days,'' Mr Spooner added. Investors and analysts are focusing on the BHP’s production report and the US jobs data expected to be released later today. BHP Billiton was seen edging 32 cents higher at $36.07 while Fortescue Metals Group jumped 8c to $5.38 and Rio Tinto gained 28 cents to $63.78. The main four banks also saw gains with Westpac advancing 35 cents to $34.35, ANZ gained 26 cents to $32.12 while the Commonwealth Bank jumped 42 cents to $74.49 and National Australia Bank edged 28 cents higher to $36.26. Australia Forex Brokers: Australia’s Benchmark Index Jumps To Highest Level.